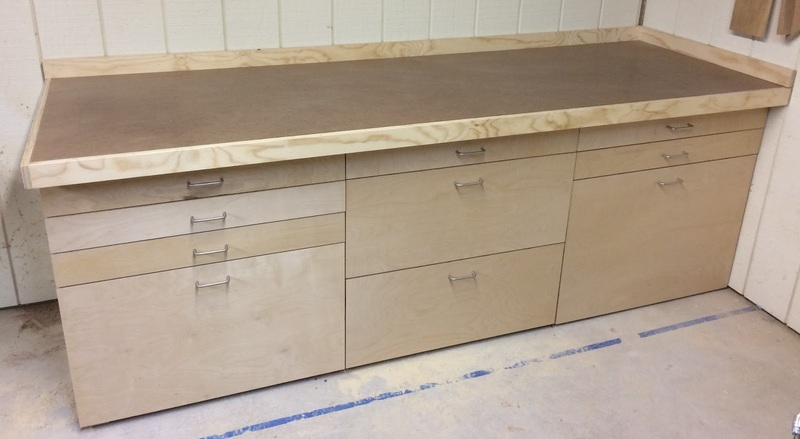 The workbench is done! Hooray! This week I made the last couple of drawers for the middle, cut the false fronts and attached them with brads and screws, and finally added the drawer pulls. Attaching the fronts went pretty easy. I just started at the top middle drawer and worked my way down and outward from there. I had a couple of 1/8" spacers to keep the horizontal gaps consistent and just lined up the vertical gaps by eye. The bottom right tray took a fair bit of fiddling because of the tightness of spacing between the drawer front and the wall and the size of the front. A little bit of patience and perseverance got it attached though. The drawer fronts look different in the picture because I source them all from scraps I had lying about. Some are probably birch and some are certainly maple. Norm had used a single sheet of plywood for his and carefully laid things out so that the grain flowed across them all consistently. For me, I decided I'd rather be frugal and use off-cuts I already had on hand. That probably saved me close to $50. 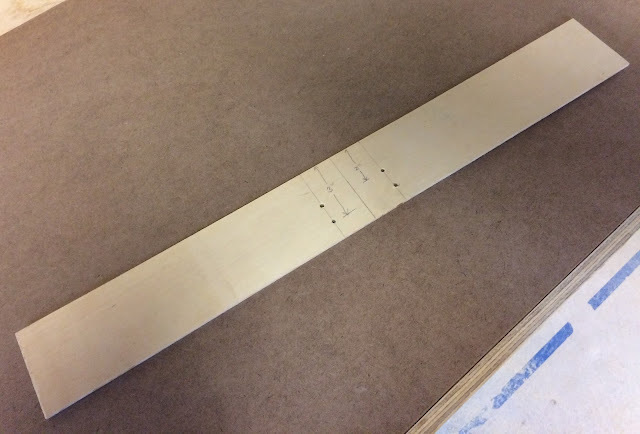 I did make a drilling template for the drawer pulls. I suppose you could measure each one individually but that's crazy. Making a template is really the right way to go. When I made the template I cut holes for 2" from the top and 3" from the top thinking I might want more spacing on the larger drawers. I ended up deciding against it and all my handles are 2" from the top of the drawer. The process for the drawer pulls was basically to clamp the template to the front of the drawer, drill the holes and then add the handle. Since this is a workshop project I didn't put any finish on it. I suppose if it starts picking up dust I may get some water based polyurethane and give it a couple of quick coats but that isn't very likely I don't think. So, is it done-done or just done? Unfortunately it is only just 'done' and not 'done-done'. The machine screws that came with the wire pulls were just the right length for a 3/4" thick front. Other than the two trays my fronts are actually 3/4" false fronts plus the 1/2" drawer box. You see all the wire pulls in the picture above because I ran out to my local DIY store this morning and bought some longer screws. I keep a very good supply of wood screws and larger bolts but not smaller machine screws. I just don't have that much need for them normally so I don't keep a supply on hand. In any case, for the top left drawer I'd tried counter sinking the holes in the drawer box. Unfortunately I'd tried free handing it and over drilled the holes so the handle on the top left drawer is loose. I could cut down the screws or I could have bought shorter screws but I think what I'd like to do is plug the holes, re-drill them then use the longer screws. I'd have done that this morning but my wife wants to do some finishing today and wants a low-dust basement for the spraying. So, no cutting plugs. The banding around the front and the backboard is plywood and I'd much rather it be hardwood. If you remember from Workshop Makeover, part 4 - New Bench Top I chose plywood because it was what i had without needing to dig through my auxiliary hardwood storage pile. Once I get the hardwood into its permanent home I'll replace that too. Let me start by saying that overall I like the New Yankee Workshop plans. They're accurate and well drawn. This project as-built is very sturdy and I am sure will give me years of good service. I also found it very easy to modify the plans - mostly the drawer layout - to meet my specific needs. That said, these plans are not for beginner woodworkers. The plans show the general construction of the project but do not include the step by step instructions that you'll find in a woodworking magazine. If you buy the accompanying video or find them on YouTube Norm does give a lot of good tips - like using a brad nailer to temporarily attach the false fronts before screwing - but doesn't have time to go into details or tips. For example, when putting the case together the first step is to screw the horizontal strips to the middle dividers. He briefly touches on this in the video but the plans have no instructions on order of construction. Also, if you don't have a helper there's no help in either the video or the plans on how to hold two large panels vertical while attaching the first couple strips (I used hand screws to hold the panels in place). The plans are complete enough but do not have every possible measurement. In all cases they can be figured out with a little reading and thought but if you don't have any woodworking background it might be daunting or lead to mistakes. This is typical of all the New Yankee Workshop plans I have read. They are very well done, the printing is very easy to read but they have just sufficient spacing, measurements, etc that you can figure out the rest on your own. I'd recommend these plans to all but the very beginning woodworker. The end result only took a few weekends of work and I've now got a very solid workbench. I'd recommend this bench to someone who wants storage and some assembly or other working area.